Posted on June 29, 2013 by Mariah W.
I had mixed feelings about this dystopian novel about a girl with a deadly touch. Incarcerated for her terrible power, the government of her futuristic society wants to use her as a weapon– but she has other plans. I loved the writing, but I didn’t particularly enjoy the direction that the plot went in. The romantic relationship was too overbearing and the protagonist, Juliette, experienced little to no character development. My least favorite thing about this book was the love triangle. When I began reading the book, I was excited to read a book about a girl who couldn’t touch anyone, but as I continued reading, I realized that the story was truly about a strange, domineering relationship. Every time that Juliette and her love interest, Adam, are together, they are either kissing or touching. As the romance becomes the center of the novel, the internal dilemma that Juliette faces (coming to terms with her past) and the external pressure she encounters (deciding if she will help the government) becomes the subplot. One of the things that I enjoyed about this book was Tahereh’s writing. Although it was slightly exaggerated at certain points, there were definitely passages that stuck out. Mafi is an incredible writer with an immense amount of talent. The novel reads like poetry, it is lyrical and rhythmic, and though I enjoyed the repetition, the use of strikethroughs were a little distracting and some of the metaphors used were farfetched. I would’ve preferred it if Mafi wrote in a more conventional style for this novel and saved her skills for future projects. Overall, this book wasn’t the right book for me. Instead of being the action-packed dystopian novel I anticipated, the plot increasingly focused on the romance between Juliette and Adam. If that’s what your looking for, then this book just may be the book for you. I spent my life folded between the pages of books. 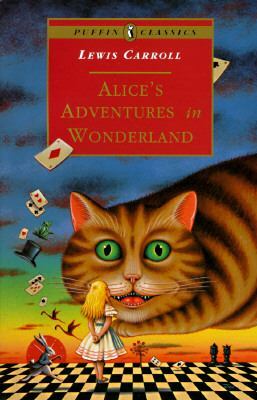 Posted on June 29, 2013 by Samantha S.
Alice’s Adventures in Wonderland is a fun fantasy book for all ages. The story begins with Alice and her sister on a bank of a river. Alice peers into her sister’s textbook, and she tries to think what is the use of a book without pictures and dialogues. When Alice begins to pick daisies to create a daisy-chain, she spots a rabbit mumbling to himself. She thinks that is natural until the rabbit pulled a pocket-watch and looks at it. The girl becomes curious and follows the White Rabbit down the deep rabbit-hole. Soon after she lands, she wanders through a long hall with doors on each side and finds a tiny door behind a curtain without a window. Later she encounters and talks to a blue caterpillar that is smoking a hookah. When the White Rabbit sees Alice, he thinks that Alice is Mary Ann, his house-maid, and tells her to fetch a pair of gloves and a fan. Afterward Alice meets the Queen of Hearts and plays a game of croquet. The croquet game uses a live flamingo as a mallet and a hedgehog as the ball. Were Alice’s adventures real… or was it all a dream? You’ve probably seen the Disney adaptation of this classic book, but did you know there’s a sequel? Read more about Alice’s adventures in Through the Looking Glass. 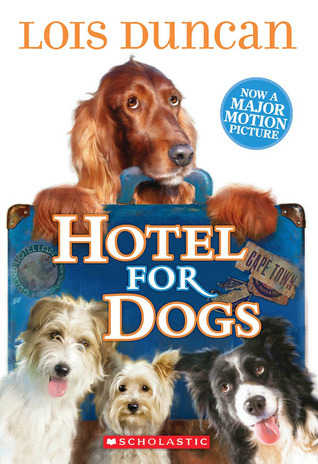 Hotel for Dogs is a heartwarming novel portraying a girl and her selfless devotion for saving helpless dogs. It displays how this commitment withstands even through separation from her beloved dog, and in turn inspires the other main characters to aid in protecting other helpless dogs. Written by Lois Duncan, author of several books for kids, this novel is a lively tale packed with action, sorrow, determination, and kindness. Hotel for Dogs is a phenomenal novel that had me captivated from the beginning to the end. Author Lois Duncan truly captures the themes of uncertainty, determination, kindness, and dedication through the eyes of a ten-year-old girl. Lois Duncan weaves the character’s personalities such that one feels as if they have known that person their entire life. Overall, I found it to be a very motivating tale. When ten-year-old Andrea (Andi) Walker is forced to leave her dog, Bebe, due to her father’s recent job placement, she is heartbroken. Not only does she succumb to losing her beloved pet, she has to deal with starting a new life in this small New Jersey town. One day, when she is upset about being unable to help a stray dog, she later finds herself convincing her older brother, Bruce, to help her find shelter for that dog, who surprises them with a litter of three puppies. Bruce, keeping true to his word, soon finds shelter in an overgrown, shabby house down the street, “The whole backyard was overgrown with knee-high grass and brambles and vines gone wild from neglect” (44). However, these kids are faced with the constant threat of keeping their secluded “dog hotel” a secret. They also must deal with Jerry Gordon, an unpleasant neighbor who is a constant threat. With help of their new-found friends Debbie and Tim, they somehow manage to provide shelter to these and other helpless dogs, and are able to get even with Jerry. The next hurdle is keeping their parents from finding out about their mini-hotel. This is nearly impossible especially after they decide to purchase that house, “Oh, Mom, no- we don’t want that house” (159). In order to find out how they ease out of this sticky situation, I strongly encourage reading the book! I would strongly recommend this novel to readers of all ages. I would definitely rate it a five out of five. 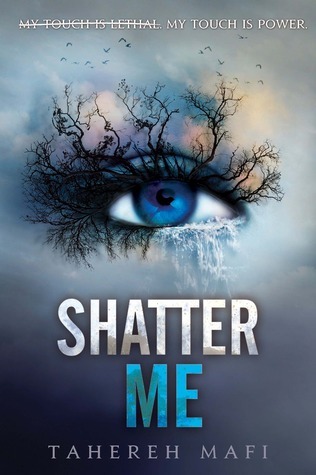 Personally, I feel that the author was able to successfully portray the characters through her vivid descriptions, and was able to effectively grasp the reader’s attention. It was a light, cheerful, and happy book. Overall, I truly enjoyed reading this story. Posted on June 28, 2013 by Miranda C.
Good Omens is a funny, original book written by British authors Neil Gaiman (Stardust, American Gods) and Terry Pratchett (the Discworld series). It is time for Heaven and Hell to destroy the world in the Biblical apocalypse, and for Adam Young, a normal preteen in a quiet English town, to realize his destiny as the Antichrist. But Crowley and Aziraphale, a demon and angel who have been working on Earth and become friends over six hundred years, decide to defy their respective superiors and save humanity. Meanwhile, the Four Horsepeople of the Apocalypse form a team to trigger the End of Days. The major strength of this book is its humor, with running gags, half-page-long footnotes, and sarcastic tangents about random aspects of humanity. Aziraphale and Crowley repeatedly attempt to listen to music cassette tapes, only to have them morph into “Best of Queen” albums if left in the car for over two weeks. War, Death, Famine, and Pollution are followed around by four human bikers trying to represent concepts such as No Alcohol Lager, Things Not Working Properly, and All Foreigners Especially The French. Witch-hunter Newt Pulsifer is pulled over by aliens (for no reason) who criticize humans for being a dominant species while under the influence of consumerism. Pratchett’s witty writing style and Gaiman’s inventive fantasy are both evident here. My favorite part of the book is near the end, where Crowley drives to help Aziraphale in a burning car held together by his own willpower, and proceeds to pick up a tire iron to fight Satan (in contrast to Aziraphale’s flaming angel sword). I also like the depictions of the Horsepeople: War as a beautiful red-haired woman who writes newspaper stories on international conflict, Famine as a thin businessman dressed in black who sells diet foods that make people starve to death, and Pollution as an inconspicuous white-haired young man who helped invent environmentally disastrous products. 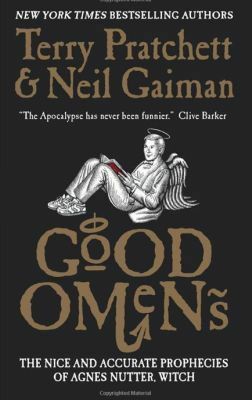 If you enjoy satirical books such as Discworld or The Hitchhiker’s Guide to the Galaxy, you should definitely read Good Omens. 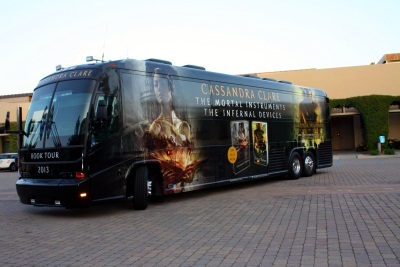 Posted on June 27, 2013 by Liliana M.
This is the final entry in our series of Cassandra Clare Clockwork Princess Tour recaps. 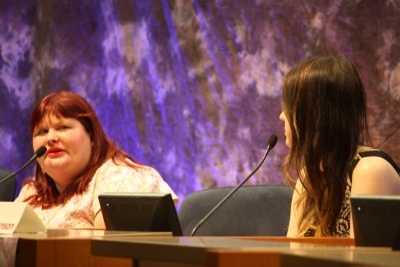 Click here and here for other perspectives on this bestselling author’s visit to Mission Viejo. When the one and only Cassandra Clare finally arrived with her allies, Maureen Johnson and Sarah Rees Brennan, everyone exploded with happiness. And they were right to do so, because the three authors were extremely funny and charismatic, eager to answer the endless questions. How do you feel to know that you are influencing people everywhere? Cassie’s first reaction was to say it’s “terrifying” because she is influencing people with her “strangeness,” but she loves how she comes together with readers with her books. Where did you get your inspiration for your series? Cassie’s tattoo artist friend told her about how in the old days, people thought that tattoos gave them protection. So Cassie thought that it would be really cool if there were a whole race of people that had that. I would have never thought that one of the top seeds in the U.S. Open of tennis would be kidnapped just minutes before her first round match, but in the book Vanishing Act, the unheard of scenario became a reality. Nadia Symanova was kidnapped before her first round match, and kid sleuth’s Stevie Thomas and Susan Carol Anderson are up for the mystery. The perspective of Stevie was interesting because his thoughts and feelings came to life. Stevie is a youth journalist who attends popular sports events such as the final four which was his last stop. He is a social boy who is a knowledgeable sports fanatic. He mostly enjoys golf, and can never stay away from his IM account, which he mostly uses to talk to his crush, Susan Carol. “He needed a shower, but as usual, he checked his IM first” (8). Susan Carol, Stevie’s partner in crime, is a kind and energetic youth journalist, as is Stevie, who is very passionate about sports. Her uncle Brendan Gibson is an agent of one of the rising stars in tennis Evelyn Rubin, but is Brendan working with other tennis players behind Evelyn’s back… You will just have to pick up the book and see.Bobby Kelleher, Stevie and Susan Carol’s journalist friend from their last stop at the Final Four is at the tournament. Bobby gets into all of the players lounges and locker rooms, and that might be very helpful after the crime. I believe that “the sky is the limit” is the major theme of this book because, Stevie and Susan Carol are both 13 and they are nationally identified as two of the greatest youth sports journalists in America. They worked hard on something they enjoyed and it led them to fame. Even though this book was a fictitious sports mystery I believe there was a moral. The moral being if you want to do or finish something, put your mind to it and make the dream a reality. Even for those who do not enjoy tennis, this book is a mysterious nail biter. It isn’t a book you can put down without finishing it. 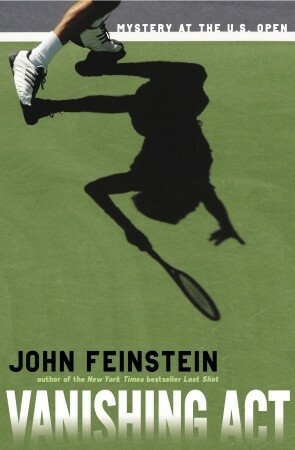 John Feinstein is a sports writer and commentator and has written many fictitious sports mysteries. He incorporates some of the books he has written in the Vanishing Act, which is an unusual writing tactic. I give this book 5 stars, there were no flaws and everything in my opinion was perfectly explained throughout the book. The resolution really surprised me, and If I were you I would pick up this book right now, find a comfortable chair, and dig into this unbelievable book! Posted on June 26, 2013 by Sabrina C.
Need some ideas for your summer reading? I’ve got some good ones! Here are my top five favorite books, and why I love them. Collins makes books with action so interesting you feel like you are in them. When I read this, the second volume in the Hunger Games trilogy, I was always on the edge of my seat. 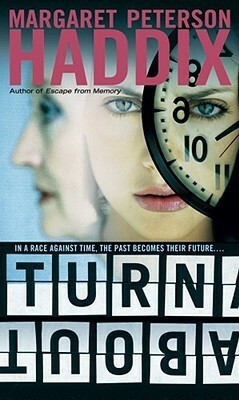 This is another book by Haddix that has to do with time travel. The story gets confusing sometimes, but in the end it all makes sense with a surprise ending. Caught is the fifth volume of the Missing series. Horowitz packs a lot of action in his series about Alex Rider, a sort of teen James Bond. It’s amazing how everything fits. In this book, the fifth volume in the series, there is lots of danger, and it’s cool how the characters survive. I loved the finale of the Hunger Games trilogy! Collins is a great writer, and I hope she writes more books like this. I was glued to this book, and absolutely couldn’t put it down.